Today was quite an eventful day in Oakland. I woke up pretty early and enjoyed taking a second walk through Chinatown. The community was bustling with folks. I tried looking for souvenirs to no avail. After Chinatown I walked to the BART metro station to take it to the Coliseum for the Oakland A's game against the St. Louis Cardinals. 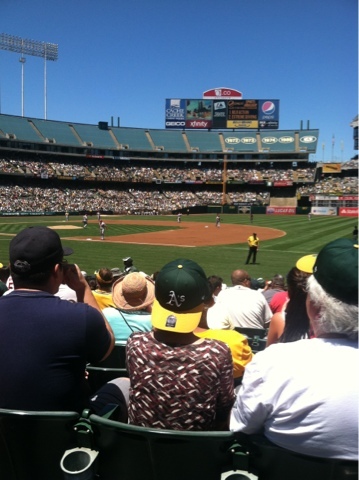 I was able to purchase a few hats outside the coliseum for five bucks each. I ended up purchasing three of them! It was such a great deal I just had to grab a few for souvenirs. 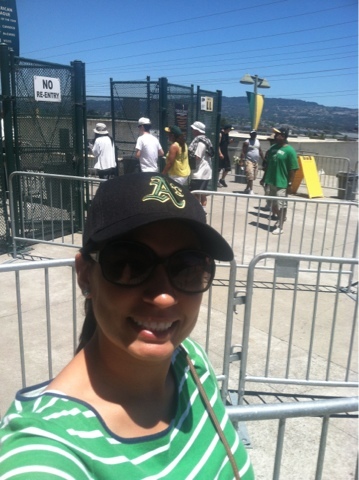 The weather in the Bay Area is great and with this heat wave it was necessary to purchase a hat. I enjoyed watching the first seven innings of the game and then headed back to the city. I lounged at the hotel pool for a while and now I'm just resting at the Marriott City Center. Tomorrow I head back home to Orange County. Visiting the Bay Area was great and next time I have to stay an extra day to visit San Francisco as well.